It’s been a week since I last checked in and I can vouch that I’ve been making progress on the work in progress, I’ve edited 5,000 words of the next Hana Walker novel. Just another 75,000 or so and the second (hardest) draft will be done, ahem. I know I need to pick up the pace, especially as summer is looming and that means scorching temperatures and kids at home, which can only slow word count. 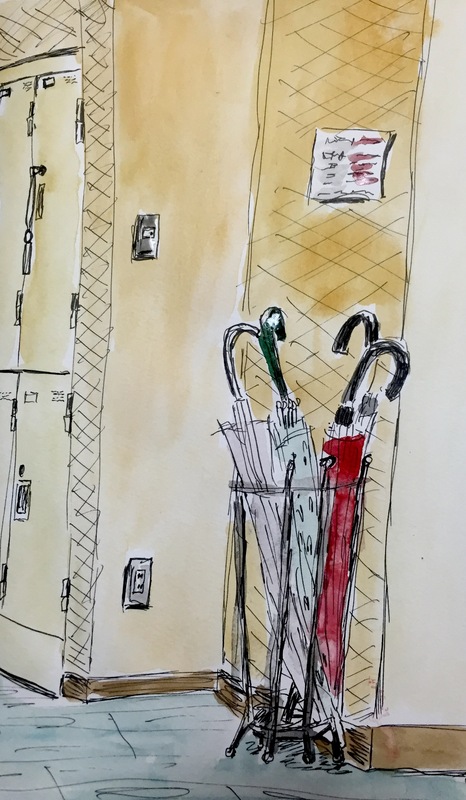 It’s still rainy season here in Abiko, and that means lugging brollies around. These I sketched while waiting at the hairdresser’s for my youngest to get shorn in preparation for the sweat-fest to come. Although, as Hana says in her latest adventure, there are only really two seasons in Japan: hay fever and flu. By the way, you have signed up for my newsletter, haven’t you? There is a free story exclusive to subscribers, I am not a foreigner, to keep you going until the novel is done.